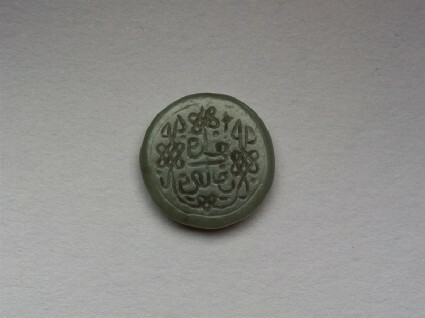 Light green jade; bezel, bevelled towards the back; circular; front angle very slightly rounded. Two lines of cursive script arranged decoratively. The inscription is surrounded by a frame consisting of plaits. This seal may be compared with another in a private collection in London, on which the same inscription surrounded by some other inscriptions is inscribed. It could perhaps be attributed to the Golden Horde, 8th/15th century - cf. coins of this dynasty, for example in S. A. Janina, 'Novyj Gorod' ( = Jangi-Shahr = Shehr al-Djedid) - monetnyj dvor Zolotoj Ordy i ego mestopolozhenie, in Numizmaticheskij sbornik, v, 1, Moscow, 1977, pp. 205-6.